Hello my name is Linda, I am a registered Childminder with Ofsted. My Ofsted visit was carried out on the 29.07.2014 .RATED GOOD . I am married to my husband, and I have 2 children, boy and girl. There now out of school so no little one to keep me busy. We live in a 3 bed semi detached house in Tunstall Bank ,Ryhope .Our house has a back and front garden that the children can play in, its very child friendly, plenty room to play and grow your own kiddie products. There will be lots of activities crafts and baking to fill their day, I always cook from scratch, with a pet hate of processed foods . If you are looking for a more intimate experience for your child I believe this will suit your needs. 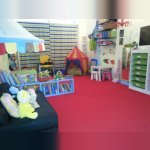 The children have a separate area to play in, my garage has been renovated for the sole purpose of making sure messy play is available at all times .Please e.mail or call anytime to ask any questions you need answering. I'm only a phone call away . As well as bringing up my 2 children, I spent 2 years at Perth collage doing Pre Nursing, then went on to working in play groups and nursery settings. Fee £4.50 per hour all food and trips included. Bank holidays £6 unless contracted day . Below are the latest reviews for Mummys L. Please note that reviews represent the subjective opinions of other Childcare.co.uk users and not of Childcare.co.uk. Parents must carry out their own checks and references on childcare providers to ensure that they are completely happy before enaging in the use of their services. My son was with Linda from 6 months of age. I was very nervous with leaving him so young but Linda made me feel very comfortable with doing this. Throughout his time with her I received pictures while I was at work when he was on day trips, painting, trying new foods which was lovely. She took him and the other children she cared for everywhere. Her garden and house is beautiful and has plenty to keep them occupied. Linda and her husband make lots of different healthy foods which my son really enjoyed. We have now moved out of town and I was very sad I had to move my son to a different provider, I still send her updates of how he is coming along as she was a very caring lady who genuinely wants to know how he is doing. Been such a brilliant help.. I had always been fortunate to have help from a family member when my 2 oldest children were young. I run a buisiness and can work long hours, my youngest child has been with Linda since she was 1 year old as my gran was too old to help with childcare , I was very anxious about leaving her with someone I hardleys knew but Linda put me at ease, informed me of my daughter's days and sent me pics while at work. My 7 year old also goes after school 3 days a week and settled in nicely with a new routine. They love going in the school holidays, they are always out and doing activities and there are different age groups for them both to play with. Linda will go out of her way to help in anyway she can, she's bubbly and friendly and I find it so funny when my 2 year old picks up her Scottish accent. I'd highly recomend Linda to any mum anxious leaving their baby to go go back to work. Linda has looked after our son since he was 10 months old and I can't recommend her highly enough. He always looks forward to spending time with her. It's a home away from home and they often spend days out at the beach, park and soft play. She has a wonderful playroom full of toys and a secluded garden for the children to play outside. She was one of very few childminders that was wiling to work extended hours for us and has been very flexible. She isn't just our childminder but feels more like a part of the family and we will miss her dearly now that our childcare needs have changed.